An early blog as tomorrow I’m off on the annual Arena holiday. Devon this year with a small posse of fellow runners. This week I was fully back into training after the illness that meant no real running for two weeks. Monday was the first attempt at anything approaching speed (except parkrun but that didn’t feel at all fast and I wasn’t really properly ready for it then). It was a simple 50 minute run but pushing the last 10 minutes a bit harder. I think I headed out a little too fast. Though actually probably not but I did push the last bit a bit more than I should have. My pace was roughly 7.40 then 7.00. It felt doable but perhaps the leap was too much. Anyway I managed it and felt OK so it can’t have been too disastrous. 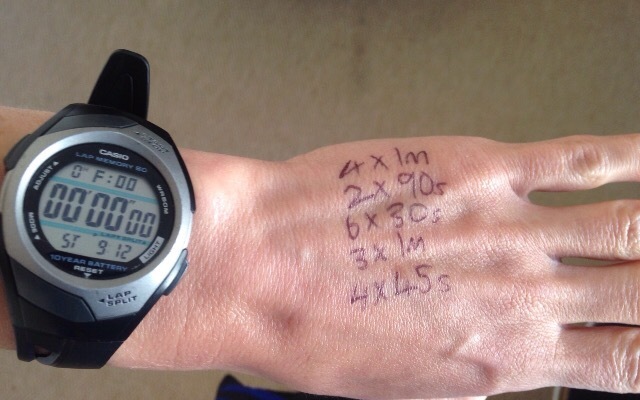 On Tuesday I had to get to grips with the most complicated set of intervals my poor brain has ever had to contend with. After a 10 minute warm up run I got stuck in. This is when I discovered I had possibly been a little over zealous on Monday. By the time I got to the 30s reps though I felt better. Between each rep was one minute of easy running, then two between each set. I just left my watch running and spent the whole time working out when the rep would finish, then when the next one would start and when I should be at the end of that set. In the end I could only work one step ahead and even that nearly blew my mind. This was or insult the most “brainy” run I’ve ever done so an excellent body AND mind workout. All that calculating probably took my mind off the running too which may have been a good thing. Although this was a hard session I enjoyed its brain frazzling nature and being something out of the ordinary. Thankfully Wednesday’s session was a nice and easy 45 minutes. No thought involved. Today (Friday) I’d been set a tempo and hills session which I was quite looking forward to insofar as it was shortish and fastish. I was no longer so pleased when I went out and discovered I was actually quite tired. Anyway I managed it. Not sure of my tempo speed (probably not tempo) but it FELT tempo-ish in terms of effort and that’s what counts. I MUST have a day off tomorrow as then it’ll be 6 days of doing lots of stuff, not just running. Otherwise it’ll be 14 days in a row which isn’t sensible and I need to remember I’ve just come back from an enforced illness break and I don’t want that to happen again. I’ve done 35 miles already this week so once Sunday has been added that’s plenty. See you all a week on Sunday! I was still well in to the cold so decided not to run on Monday but just help at the Arena super series track 3000. There was an excellent turn out. Tum te tum. I felt like I would never get better as the cold dragged on… and on… and on. I could probably have run on Wednesday (perhaps unwisely) but “luckily” I woke up to find I had fat purple eyelids. I took this as an omen I should wait a little bit longer. By Thursday it was TIME. I set off on a tester jog in the direction of the Peace Statue. It was quite windy in both directions and my run was slow but everything seemed fine. Phew! This meant I could once again get started on a set coaching week. Starting off gently with a 45 minute run with 6 x 15s strides at the end in Friday. This went well with the easy part of the run a little faster than the day before. I fitted the stride sections into the gaps between road crossings. 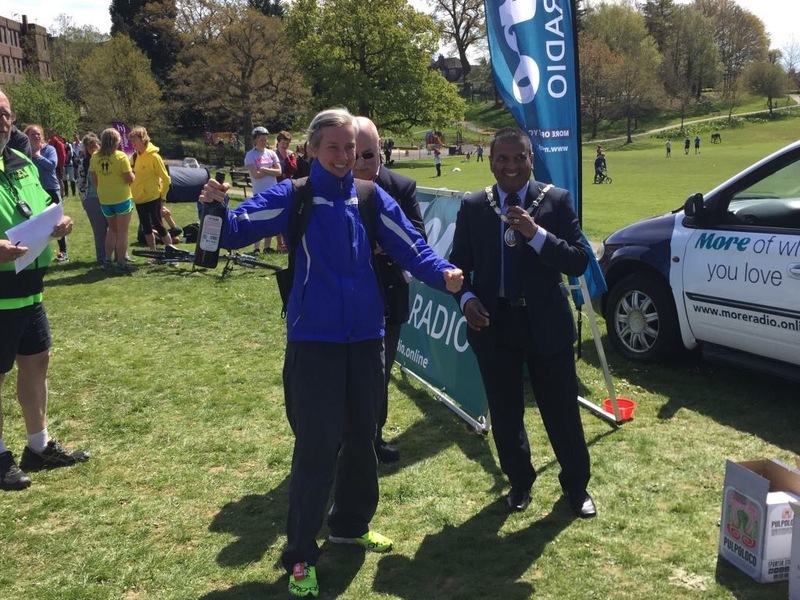 On Saturday I was to run parkrun however. This turned out to be a consistently (as consistently as I get anyway) paced not very speedy 22.19. Halfway in 10.55 so the traditional loss of 20 or so seconds in the second half. As I haven’t run fast for a good three weeks this was to be expected and at least I felt fine, just not fast-fit. This morning (Sunday) a 60 minute run was on the agenda. I had planned to make this hilly but I wasn’t feeling particularly spritely so thought it would be more sensible to just keep it flat and easy. I’ll be doing enough hills on the Arena holiday in a week’s time and I mustn’t forget I’ve only just got over the killer cold. 21 miles for this very short running week. As always happens after a long period of hard training and not enough rest (probably) I succumbed to a rampant and long lasting cold. This is part of why I want to follow a proper training plan so I don’t keep doing this but obviously as I just started it without having rested from all the stuff I did before it didn’t help. Anyway well over a week after catching it it’s still hanging around. 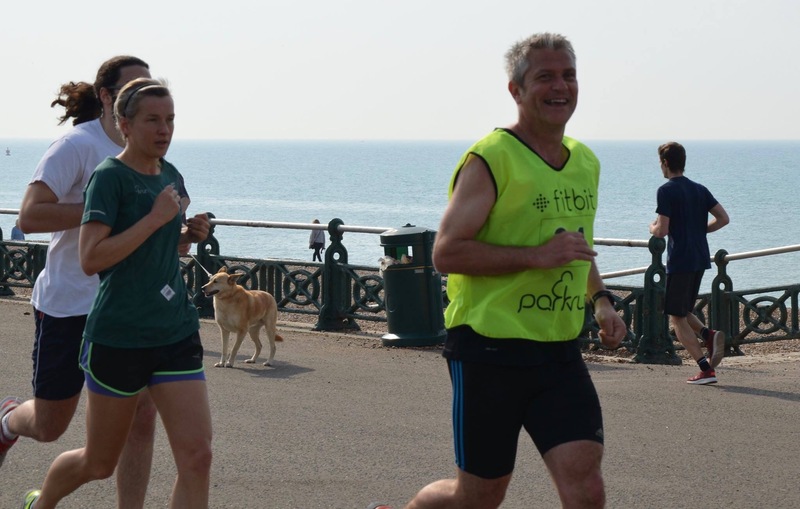 I’m on the way out (of the cold, I’m not quite at death’s door yet) but I probably didn’t help myself by defying instructions and running both parkrun and Hastings 5M this weekend. I did them both at an easy pace so hopefully haven’t done any further damage. Anyway nothing to report so here’s a photo of me having a pleasant parkjog on the prom on Saturday. Monday was supposed to be 45 minutes easy + 4 x 10 second hill sprints but when I came to do the sprints a blinking lorry was driving up and reversing down the hill I wanted to use. Pitfall of trying to use a narrow harbour delivery road. My plan b was also scuppered when I arrived at the steps at the side of Woodies to find it full of smokers and an old woman descending. I very maturely became even more enraged but moved on to plan c which was not much more than a gentle slope and only long enough for 6 seconds of sprint. Thankfully there was no-one on it though or I may have had to kill them. I don’t deal very well with having to change a plan. Anyway I did it but it meant the easy run was a mile or so longer than it should have been and the boiling rage probably wasn’t good. Luckily track on Tuesday was completely empty so Rob and I could get on with it undisturbed. The session was (5 x) 600t, 1 min jog, 200f, 2 min rest. I had planned the 600s to be 2.15 and that’s near enough what we did (the first was 2.18 as I was getting a feel for the pace) then the 200s were whatever I could manage which turned out to be 41/42s (except the first – 43). This was a hard session especially because the 200s were into a freezing headwind but I was pleased with it. On Wednesday it was 40 minutes easy and it wasn’t that windy so for once it really was easy. Thursday it was back to the hill for another 8 x 45s. The wind wasn’t too strong and in the other direction so I could run up much more easily (not easily but without massive wind resistance). I didn’t have my watch so just ran up to the lamppost. Nothing really to be said about this. It was hard, but only as hard as it should be. Friday was a rest day so I just did the core video in the morning. Managed a bit more than last time and no DOMS this time. 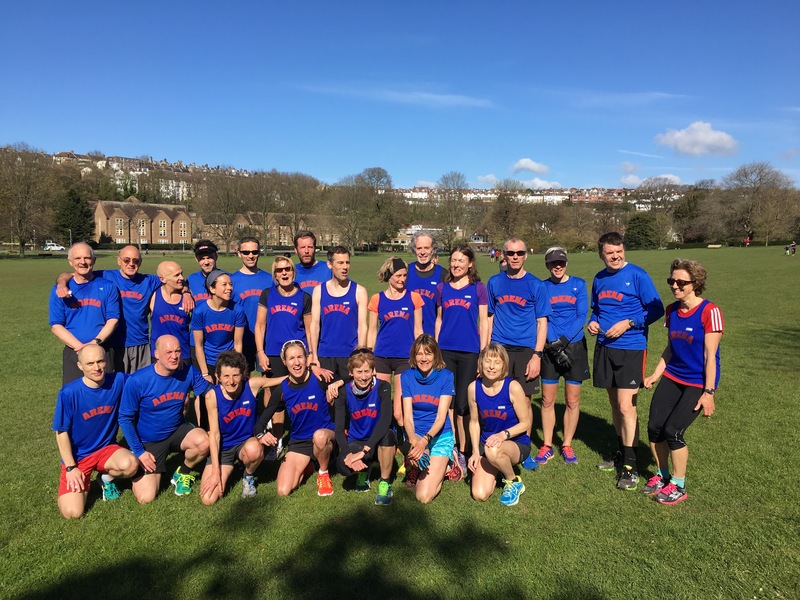 On Saturday it was the Arena superseries age graded run at Preston Park parkrun. I was supposed to go out hard and see how far I got before dying. Unfortunately I had developed a massive cold on Friday and “dying” was how I felt before I’d even got there. So I just tried to run. I managed to be 80th though so at least I can claim that for Arena. 21.41. Post run photo with fellow Arenas. I must be ill as I’m smiling. 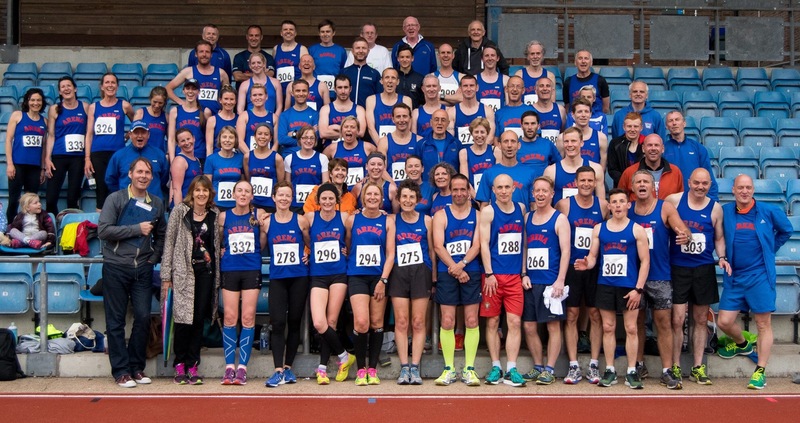 On Sunday it was the Hayward’s Heath 10 mile race. I don’t know why I always do this race as it’s very hilly. At the moment it’s even worse as I haven’t run more than 6 miles for ages. However it would be a good training run as if I hadn’t done it I would have been set a 90 minute hilly run anyway. I was feeling somewhat better so decided I’d do what I was supposed to have done on Saturday. Go out hard and see where I died. I knew this would mean a horrible second half. Turns out death arrives somewhere between 3 and 4 miles. Which meant a mere 6 or 7 miles of horridness to get to the end. I just put in the effort even when sometimes this still meant I was hardly moving and then when I could get going again I did. Thank goodness for no GPS as it would be the worst pace graph ever. World’s greatest positive spilt. Anyway, somehow, I finally reached the end. A good training run with an extra 7 miles of mental strength practice. My time was 1.18.00 a mere 7 minutes and 5 seconds off my best. But today was never going to be speedy. Just a hard training run. The Arena ladies won the team prize and whilst I was waiting for them to collect their prizes I found that I had won the O35 prize! What the? Unfortunately today (Monday) I feel worse than Saturday. Why do I always get a cold after any sort of hardish training? Grrrrr!